Oktoberfest Saloon Door Cutouts. This includes two cutouts. Wild West Saloon Door Cover. A great affordable addition to your Cowboys & Western party. ---Approximately 240cm x 100cm in size ---Features an incredible illustration of a Wild West Saloon entrance with a barrel, a boot and a cowboy hat waiting outside ---Every banner is made from high quality material that can be used indoors or outdoors. 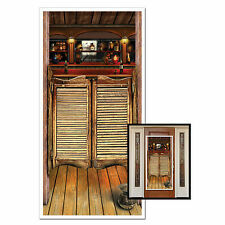 Wild west door cover decoration Perfect for a themed party Colour: Multi-coloured Size: 152cm x 76cm approx . Saloon doors do not actually swing open or close. While this does look great on a door, you can also hang it on the wall or even hang it flat from a ceiling. Attach to the door with double-sided tape. See All our Western Party Supplies. 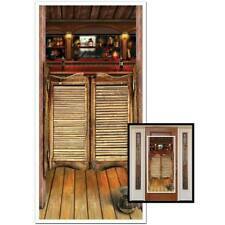 Oktoberfest Saloon Door Cutout Set Size: 24.5" x 17.75"
View Our Complete Oktoberfest Collection. 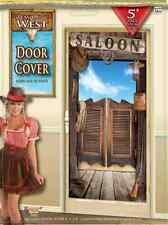 Forum Novelties "Way Out West" Party Door Cover. "Way Out West". Door Cover. In a hurry?. It can be used either indoors or outdoors and needs to be applied with tape, tacks or Sticky Tack. This set is not self-stick like decals. 30" x 60" SALOON DOOR door/wall panel. Made of All-Weather Plastic.